Hiring a cheap and affordable Car in KwaZulu-Natal is easy with Xtreme Car Rental. Book your rental car online or by telephone and pick it up at King Shaka Airport or from one of Xtreme Car Rental’s many locations. Our car rental branches include Durban, Pine Town, Pietermaritzburg and Pietermaritzburg Airport. Xtreme Car Rental covers all the important International airport terminals and regional airports in KwaZulu-Natal. You can pick up and drop off your rental car at King Shaka International Airport, Pietermaritzburg Orbi airport and Richards Airport on request. If you are flying into, or around KwaZulu-Natal, we can serve you with your car hire needs at these airports. Xtreme Car Rental is well represented with 6 locations across the province to meet your car, pickup, 4×4 and people carrier rental needs. Our staff are friendly and efficient, from booking all the way through to pick up and return of the car hire they will assist you in any way they can. Whether you are here for business or leisure, need a car for a short term or long-term period and want to pay with Cash, by Debit Card or even EFT, we will find you something to suit your needs. 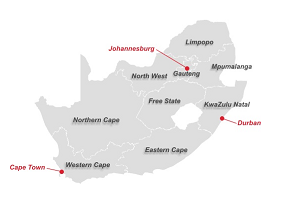 Take a look through our locations within KwaZulu-Natal – below – before you travel and contact us so that we can help you find a vehicle to suit your budget. For a quick and easy Car Bookings in KwaZulu-Natal use our Quote & Book. The gorgeous & glamorous South Coast of KwaZulu-Natal is a summer hotspot and a destination favourite for local travellers. Whether you are visiting KwaZulu-Natal for a vacation with family or with a group of friends; why not hire a cheap car from Xtreme Car Rental for a hassle-free ride? KwaZulu-Natal is a popular tourist destination in South Africa. It offers travellers all sorts of amazing attractions and adventures to make any holiday a memorable experience .With its perennially warm weather, fabulous beaches and year-round entertainment, it’s no wonder KwaZulu-Natal is known as South Africa’s playground. To the east lies the city of Duran and many small coastal towns accessible only by car. To the south hundreds of kilometres of subtropical coastline stretches out for as far as one can wish for, perfect for that lazy summer afternoon road-trip or drive. To the west lies the majestic Drakensberg mountain range a 4×4 enthusiasts paradise offering a range ofdifferent off-road terrains any one could ever dream off, and to the North lies some of South Africa’s top game reserves. So just jump in your Xtreme Car Rental hired car right away and get ready for a fabulous time in KwaZulu-Natal.